We are responding to Africa’s challenges by preparing visionary leaders of integrity, equipped with a deep knowledge of the Bible and the world about them. They must be equipped to serve broadly; scattered like salt among the rich, the poor; the educated, the unschooled; the violent, the peaceful. Such equipping requires much more than “book knowledge” or even knowledge of the Book. It requires formation and motivation by the Spirit of Christ. 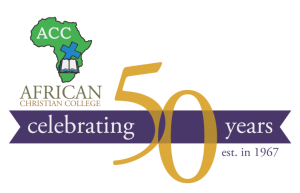 While studying at African Christian College, students develop new perspectives, learn new skills, discover new ideas, practice various methods, and gain a deep knowledge. Though these things are important, we have not done our job if we have not nurtured a passion for Christ’s mission, encouraged habits of spiritual formation, and provided an environment for students to deepen their faith in God and clarity in their call to serve in the Kingdom of God. Attending college can be a once-in-a-lifetime opportunity for developing spiritual practices that can be continued for a lifetime. Spiritual disciplines are studied and encouraged as part of a Spiritual Formation course all students are required to take. Many find this a challenging and helpful time of connecting deeper with God. Students and faculty encourage accountability in these behaviours. As a community, we practice communal spiritual habits together. On class days, we come together for Chapel as a time of prayer, praise and worship, and biblical teaching. Each Wednesday evening we share a meal and worship together. On Sunday evenings, we share a time of worship together. We integrate faith into the learning of all our subjects, but we also have courses designed to teach students how to read the Bible for personal growth and for teaching others. There are also numerous courses on biblical texts and theological studies to help strengthen students’ understanding, knowledge, appreciation, and dedication to the Word of God. Outside of class, students and faculty share difficulty conversations about the Bible, theology, and how it impacts our lives. Our large theological library offers a rare opportunity for students to independent study about many biblical topics. We encourage student involvement in local bodies of faith, but also seek to provide spiritual community at the college. In many ways, this happens naturally as we all live together on campus. Spiritual community is deepened as we share life’s challenges, losses, successes and joys through friendship, mentoring, and accountability.